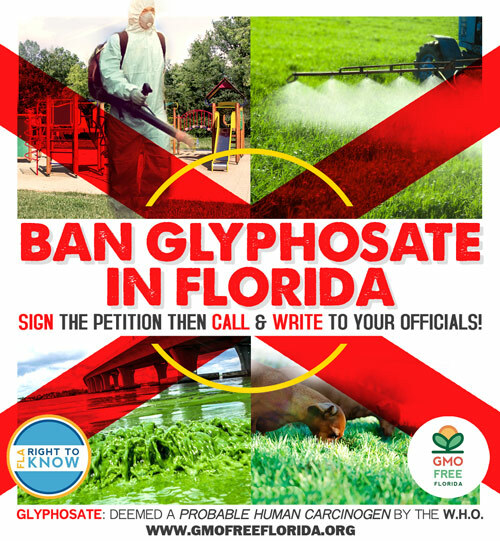 A petition campaign created in collaboration with GMO Free Florida and Florida Right to Know calling for a statewide moratorium on the use of Glyphosate, the main active ingredient in the most popular pesticide used on non-organic crops. When it was revealed by the World Health Organization that glyphosate was deemed a probable human carcinogen, this campaign was launched to create awareness of the petition and encourage constituents to contact their elected officials to achieve a ban that would minimize human exposure to these toxins. The design features a collage that shows the unexpected places where the toxic chemical is being applied: agricultural runoff, lawns, and even playgrounds, which is overlaid with a giant red “X” in the shape and thickness of the Florida state flag.